The causes of mouth ulcers are trauma, aphthous, skin associated disease ( bullous erythema multiforme, pemphigoid, pemphigus and Lichen planus) , neoplastic lesion ( agranulocytosis, hematological disorder(leukemia) and squamous cell carcinoma), inflammatory condition ( Crohn’s disease ), connective tissue disorder ( SLE, Reiter’s disease, Behcet’s disease) and infection ( fungal candidiasis, viral herpes simplex and bacterial syphilis and Vincent’s angina /acute ulcerative gingivitis. Mouth ulcers are common. It is important to differentiate between benign mouth ulcer or malignant mouth ulcer. Based on the history, oral ulcer may occur with SLE ( systemic lupus erythematous ) and it is important to elicit any signs or symptoms of SLE such as renal failure, pain in the joints and skin lesion. Besides mouth ulcer patient may also complain of labial or scrotal ulcers, eye disease or arthritis in patient with Behchet’s disease. Reiter’s disease patient may complain of arthritis, conjunctivitis and urethritis besides mouth ulcer. History of sexual contact is important in this scenario. Neoplastic lesion such as squamous cell carcinoma may occur as a ulcer which is bleeding and with hard edges. Squamous cell carcinoma ulcer tend to affect older people. There should be history of sepsis, sharp tooth, spices , spirits, smoking syphilis and leukoplakia. Mouth ulcer may also occur due to agranulocytosis. The ulceration may occur due to infection by bacteria as a result of low white cell count. Careful drug history is required. Mouth ulcer may present due to leukemia. Traumatic mouth ulcer is easily identifiable if the patient has ill fitting dentures or teeth which is sharp. The ulcer in this case will heal after the causes have been treated. History of skin disorder such as erythema multiforme, bullous pemphigoid, pemphigus and lichen planus are also important as one of the contribution of mouth ulcers. Painful mouth ulcer, gum swelling and lip swelling are important characteristic of granulomatous disease ( Crohn’s disease). Aphthous ulceration is present in patient who suffer from chronic debilitating disease, Crohn’s disease or Coeliac disease/ Aphthous ulceration is presented as a small painful ulcers inside the lips or cheeks. The healing process is about 1 week and other ulcers may occur during the time being. Syphilis may present gummas, chancres and nail track ulcers within the region of the mouth. Painful vesicle which is ulcerated is due to the present of Herpes simplex infection.It is commonly affecting immunocompromised patient. Herpes zoster infection may affect palate in the distribution of the trigeminal nerve ( maxillary division). The pain is severe and ulcerated. History of immunosuppressive therapy ,debilitating illness and diabetes may predispose the patient to candida infection of the oral cavity. 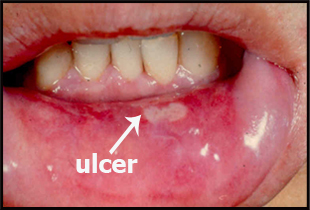 Acute ulcerative stomatitis ( Vincent’s angina) present with small ulcer and swollen gum that spread to buccal mucosa. The patient complain of fever, malaise and bleeding. A persistent painless hard solitary ulcer is mostly malignant and urgent action should be taken. Mouth ulcer may occur due to iron or vitamin deficiency so check for any angular cheilitis or glossitis. Agranulocytosis may occur due to carbimazole intake. Drug history intake is important. On examination, SLE is presented with oral ulceration and signs of renal ,joint and skin disease. Painful ulcers and features of labial and scrotal ulcers, iritis, keratitis and arthritis are commonly associated with Behcet’s disease. Mouth ulcers, balanitis, conjunctivitis and urethritis are associated with Reiter’s syndrome. Neoplastic ulcer is typically hard with everted edges that will bleed on touching. Enlargement of cervical lymph node may occur. Traumatic mouth ulcer is due to sharp teeth or ill fitting denture. The present of bleeding gums and ulceration are associated with hematological disorders. Acute ulcerative stomatitis or Vincent’s angina may present with yellowish ulcers on the tonsil and buccal mucosa. Besides that, Vincent’s angina may present with red swollen and bleeding gums as well as lymphadenopathy which is tender in nature. Syphilis is presented with gummas, snail track ulcer and chancre. Herpes simplex infection may present with 2 mm small vesicles that coalesce and ulcerate to produce erosion and erythema. Herpes zoster present with ulcer surround with erythema ( redness) in the maxillary nerve distribution of the palate. Candidiasis appear as a red patches that are covered with white patches of epithelium which is desquamosation and mixed with fungus. Painful linea oral ulcers, granular gingival swelling diffuse in nature and nodular thickening of the buccal mucosa and lip swelling are commonly due to inflammatory condition. Aphthous ulcer is characterized by small circular deep white painful ulcer with surrounding erythema lesion. Aphthous ulcer may affect normal individual besides chronic debilitating or gastrointestinal disease sufferer. The investigations require may include full blood count, ESR, urea and electrolytes, swabs, antibody screen, VDRL, viral antibodies and biopsy. Full blood count may reveal low hemoglobin due to debilitating illness or malignancy. Raised white cell count is due to leukemia. Raised ESR commonly occur in chronic infection syphilis, connective tissue disorder or malignancy. Urea and electrolytes are useful in assessing renal function ( SLE is associated with renal disease). Swab is taken for culture and sensitivity to rule out infection such as Candidiasis and Borrelia Vincentii ( Vincent’s angina). Antibody screen may reveal increase in anti - double stranded DNA or ANA positive for SLE. VDRL is useful to rule out syphilis. Viral antibodies study are useful in herpes zoster or herpes simplex virus detection. Biopsy is performed in case of Crohn’s disease and squamous cell carcinoma.